The field of computer networks is a multi-faceted one with exciting job prospects. By choosing our course, you will be able to achieve excellence in the design and implementation of networks, and gain industry-recognised certifications such as Cisco's CCNA and CCNP. 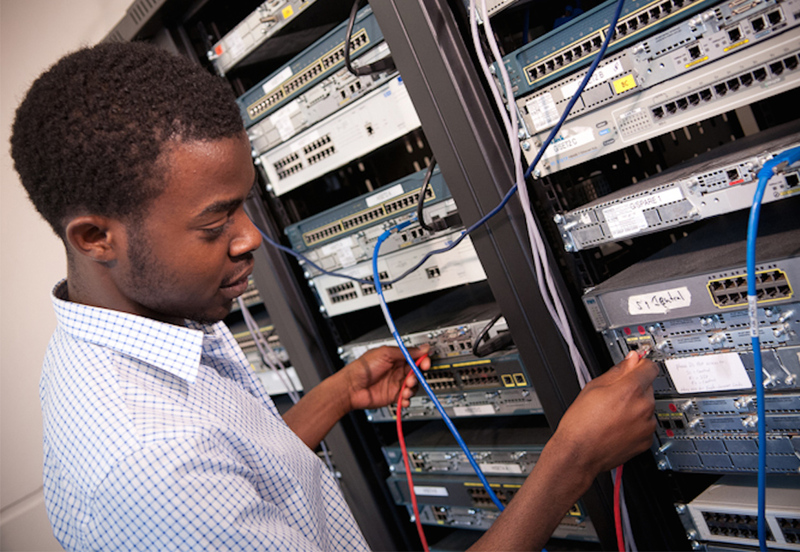 Our diverse Computer Networks degree prepares you for entry into this exciting field. The focus is on the steps and strategies that can be adopted to mitigate security threats to networks, and internet or network applications. You will be taught by experts in the field in a high-tech lab, have access to specialist equipment and take part in practical hands-on experiments in our modern Cisco, Xilinx, and mobile communication labs to illustrate the application of theory and concepts. This multidisciplinary course provides you with the opportunity to undertake exciting 12-month work experience placements as well as the chance to gain industry recognised certifications such as Cisco's CCNA and CCNP. What will you study on the BSc Computer Networks? The course explores the principles of up-to-date network systems and focuses on key operational and technical aspects. Core modules such as Data Communications, Computer Networks, and Programming and Problem Solving for Communications are covered in this course. You will have the opportunity to put what you've learned to practical use and make valuable industry contacts; even more so if you decide to complete a work experience placement in your second year. You will gain the practical competencies in network design and the development of mobile internet applications and services. You will learn how to deploy practical techniques in the development of a range of network systems and internet level applications from the very start of your studies. This module will provide you with the basic skills needed to succeed in networking-related degree programs. It provides a hands-on introduction to networking and the Internet. The primary focus is on learning the fundamentals of networking and on routing and routing protocols. You will become familiar with the various network devices, network addressing schemes and the types of media used to carry data. You will develop an understanding of how a router learns about remote networks and determines the best path in those networks. The aim of this module is to provide you with fundamental concepts and principles of computer hardware and operating systems. By taking this module, you will gain an understanding of how the computer's hardware enables it to function as a networked, multi-media machine. The module focuses on the understanding of concepts, theory and associated terminology. Practical hands-on laboratory experiments are used to complement the theoretical aspects. The overall aim of the module is to provide the knowledge and skills required for understanding inter-networking computer systems. This is achieved through the study of relevant general mathematical and scientific principles. These principles are applied to illustrate the operation of hardware components such as logic gates, processors, controllers and data storage devices. The material covered ensures that you are suitably equipped with the theoretical understanding needed for subsequent course modules. This module introduces fundamental computational concepts and programming constructs used in a range of programming languages. The main aim is to help you learn to program effectively. Several data structures of interest to Networking scenarios are considered. The concept of an algorithm is introduced early on together with techniques for program implementation. You will be encouraged and supported - both individually and within small groups - in a variety of laboratory-based problem solving tasks. This module provides you with the skills needed to succeed in networking-related degree programs and also helps you develop the skills necessary to fulfil the job responsibilities of network technicians, network administrators, and network engineers. The primary focus of this module is on the architecture, components, operations of routers and switches, the WAN technologies and network services in a large and complex network. You will also develop knowledge about the trends in networking including Cloud, virtualization, and SDN. This module addresses the fundamental principles of electronic communication, particularly as applied to digital data. A key development in the last decade has been the seamless integration of many different data types (documents, images, speeches) on to common communication platforms. These communication platforms have themselves spawned new functionality, so that we are well on the way to being able to access any data/function on any device, anywhere. The main aim of the module is to provide an operational understanding of how current communications systems work, and specifically how we can communicate information over any distance with a high degree of accuracy and reliability. As part of this, issues of encoding data, capacity, data compression, bandwidth, security and cryptography are covered. The aim of this module is to enable you to gain knowledge of professional project management in the context of your degree and likely future profession. You will be able to use this knowledge by participating in a ‘real world’ group project. You will focus on all aspects of professional practise including project management and you will also study ethical, legal, regulatory, organisational and business issues in order to further your employability within the computer and communications fields. Internet Protocols are the backbone of global communications and will be thoroughly examined in this module. You will focus on all aspects of networking and protocols including Internet Protocols, Network Services and Cloud Environments as well as Network Monitoring and Analysis, ARP, IP, UDP and TCP. You will also examine the use of network services including DNS, DHCP, CIFS and Ecommerce platforms such as LAMP. The module will allow you to explore how these systems run on Cloud Service Platforms leading to the development of the Intelligent Edge Environment (IEE) and you will gain the ability to build and analyse any networking environment independent of the underlying physical networking technology. Finally, you will also investigate issues of network monitoring, network analysis and network performance. This module is designed to equip you with the knowledge and skills needed to plan, implement, secure, maintain, and troubleshoot converged enterprise networks. You will learn how to implement complex enterprise LAN and WAN routing and switching solutions. Comprehensive labs emphasise hands-on learning and practice to reinforce configuration skills using a range of routing protocols in IPv4 and IPv6 environments and the secure integration of VLANs, WLANs, voice, and video into campus networks. The course also covers the configuration of secure routing solutions to support branch offices and mobile workers. The module reflects the job skills and responsibilities that are associated with professional-level job roles such as network engineer, systems engineer, network support engineer, network administrator, and network consultant. This module provides you with the opportunity of choosing and working on a project that reflects your interests. The project should constitute a practical problem-solving activity relevant to current network or communication technology. The primary aim of the module is to consolidate and deepen your understanding of material taught on your programme and to investigate and/or develop a product, process or application relevant to the focus of your programme. This module is designed to equip you with the knowledge and skills needed to monitor and maintain complex, enterprise routed and switched IP networks. Skills learned include the planning and execution of regular network maintenance, as well as support and troubleshooting using technology-based processes and best practices, based on systematic and industry recognized approaches. Extensive labs emphasise hands-on learning and practice to reinforce troubleshooting techniques. The module reflects the job skills and responsibilities that are associated with professional-level job roles such as network engineer, systems engineer, network support engineer, network administrator, and network consultant. This module is designed to equip you with the knowledge and skills needed to consolidate many computer networking concepts and introduces elements of network design, equipment selection and configuration, and LAN and WAN addressing. An integrated case study presents critical thinking scenarios to help you develop skills such as analysing business objectives, determining technical requirements and constraints, planning timelines and resources, and preparing and delivering customer presentations. The module reflects the job skills and responsibilities that are associated with entry-level career opportunities in networking. This module aims to develops acritical understanding of the principal ways in which a mobile computer, or device, can access a network through theoretical discussions and practical laboratory work. Specifically, it aims to develop an appreciation of the design, characteristics, operation, and Quality of Service issues of WLANs and Cellular networks supporting mobility. In addition, the use of wireless networks and mobile computing to enable the latest generation of ubiquitous and pervasive computing will be addressed. The module also covers mobile application development and explores how applications can be made location and context aware. Central themes of the module are: i) the associated standards and protocols including use of the Internet Protocol in mobile scenarios; ii) an appreciation of privacy and security issues in wireless networks and how these can be resolved. How is the BSc Computer Networks taught? The emphasis of this course is very much on learning by doing. You will learn how to use specialist equipment in our computer laboratories and will work on group and individual projects, as well as consolidating your learning at seminars. You can opt to extend the course by a year, and spend the third year doing a paid work placement, which will lead to a certificate of industrial achievement. You will be assessed through practical assignments, laboratory exercises, demonstrations of your work and group and individual projects and presentations. You will also sit exams and submit coursework, including research reports and design documents, and there will be some seminar-based assessment. You will receive regular feedback on your work, including your assessed coursework and exams. You must have competence in English language to study with us. The most commonly accepted evidence of English language ability is IELTS 6.0 (with minimum 5.5 in all components). Visit our English language requirements page for a full list of accepted tests and qualifications. Most undergraduate applications are made via UCAS. This also relates to mature students and applications to transfer to Middlesex University. You'll need our UCAS institution code to complete the form: M80. Each course also has its own UCAS code which can be found at the top of this page. How can the BSc Computer Networks support your career? As a Computer Networks graduate you will have excellent career prospects. The range of potential employers will be vast across the private, public and not-for-profit sectors. You will also have the potential to start your own business. As an applications developer your role will include writing specifications and designing, building, testing, implementing and sometimes supporting applications using computer languages and development tools. You may also specialise in a specific development environment, such as computer games or e-commerce, and you will have in-depth knowledge of a few relevant computer languages. The role of the ICT manager is to ensure that information technology resources are aligned with the organisation's mission, corporate goals, and the corporate strategic plan. Your role will include developing, maintaining, facilitating and implementing information frameworks in line with a corporate ICT strategy, and supporting policies and defining standards associated with information management. A network engineer is responsible for installing, maintaining and supporting computer communication networks within an organisation or between organisations. Your role will be to ensure the smooth operation of communication networks in order to provide maximum performance and availability for their users (staff, clients, customers and suppliers). Software engineers research, design, test, implement and maintain software systems to meet client or employer needs. In this role you will use a variety of computer programming languages and applications, working in teams with other IT professionals, or alone. Systems developers test systems, diagnose and fix faults, write diagnostic programs, and design and write code for operating systems and software to ensure that they function more efficiently. In this role you may also create systems in response to technical specifications supplied by an IT analyst, often integrating off-the-shelf software packages into existing systems. This course challenges me in all the right ways. I've developed skills I didn't even know I had and used the latest multimedia platforms to set up and configure an enterprise gigabit network. These are all skills that employers are looking for at the moment. The facilities for interaction design include an observation control rooms, test areas and networking labs that are kitted out with the latest equipment - all these facilities are second to none. It's the combination of great course content, amazing facilities and the fact that I got to customise my course by choosing specific second year modules, that made me want to come to Middlesex. The thing I like most about computer networks is that the skills we are developing are those that employers within the industry are looking for. Hands-on experience is gained through laboratory sessions where we work with real network equipment and network management software. This means that students not only have the theoretical knowledge of network management but also the practical implementation. By the end of the course you are equipped with the knowledge and confidence to design, implement, secure and manage computer networks. 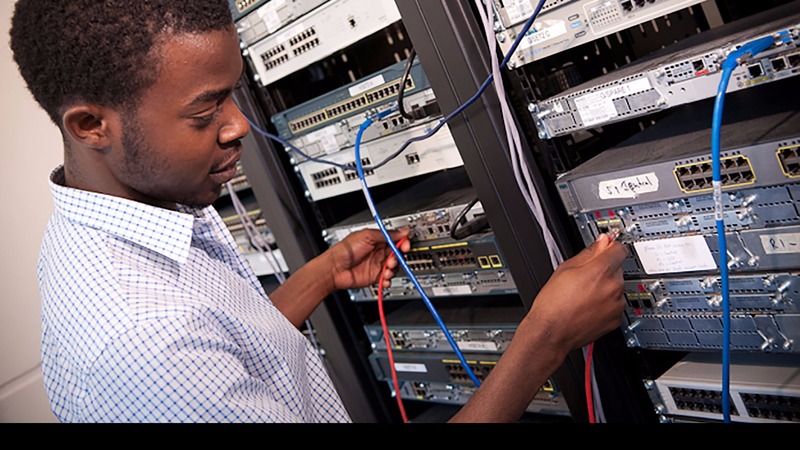 Students can go on to gain industry recognised certifications such as Cisco's CCNA, and even CCNP. This is something that I have really enjoyed doing, though it has been challenging. All of my instructors have been great, they are very supportive and I thoroughly enjoy learning from them. Middlesex graduate Damian Milkins is president and co-founder of Control Circle, a global IT services company. Watch a video of Damian discussing his time at Middlesex and his thoughts on our investment in the latest facilities and equipment.